After attending the Maple Leafs training camp in September 2008, James Reimer was assigned to the Toronto Marlies of the American Hockey League (AHL). After starting the season with the Marlies, Reimer was assigned to the Reading Royals of the ECHL. He was recalled by the Marlies and recorded his first AHL win by a score of 3–2 in a shootout on December 27, 2008 against the Manitoba Moose. 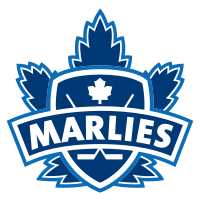 In two stints with the Marlies, Reimer had a record of one win and two losses, with a goals against average (GAA) of 3.28 and a .882 save percentage. With the Royals, Reimer had a record of ten wins, seven losses and three ties. 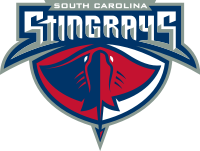 At the ECHL trade deadline, Reimer was moved to the South Carolina Stingrays, a team that had gone through eight goaltenders during the season. The deal was facilitated to expose Reimer to post-season experience, as the Royals were out of playoff contention. While with the Stingrays, Reimer helped them win the 2009 Kelly Cup championship. Recording four wins and one shutout over eight games in the post-season, he was named the ECHL Playoffs Most Valuable Player. After attending the Maple Leafs training camp ahead of the 2009–10 National Hockey League (NHL) season, Reimer was again sent down to the AHL. As part of the Marlies' pre-season, Reimer competed in the Gardiner Cup, held as part of Scotland's 2009 Homecoming celebrations. He stopped 33 shots in the final as the Marlies lost 3–1 to the Hamilton Bulldogs. Back in the AHL, he spent the majority of the 2009–10 season with the Marlies, playing in 26 games and recording 14 wins. He had a GAA of 2.25 and a save percentage of .925. Reimer was called up by the Leafs on an emergency basis on October 13, 2009, when starting goaltender Vesa Toskala was injured. Serving as Joey MacDonald's backup, he did not receive any playing time in his first NHL call-up; he was sent back down to the Marlies on October 25, 2009. Reimer missed significant time with an ankle injury during the 2009–10 season. It was not the same ankle he injured during his final season with the Red Deer Rebels. At the outset of the 2010–11 NHL season, Reimer again was assigned to the AHL's Marlies. Reimer was not expected to contribute to the Maple Leafs at the NHL level during the 2010–11 season. Expectations for the young netminder were low heading into the season, with head coach Ron Wilson saying "We wanted him to play in the minors and continue to get better, develop and try to stay healthy." He was recalled by the Maple Leafs several months into the season, making his his NHL debut on December 20, 2010 in relief of Jonas Gustavsson against the Atlanta Thrashers. He played 14 minutes in the third period, stopping all four shots he faced. Reimer made his first NHL start against the Ottawa Senators on January 1, 2011. 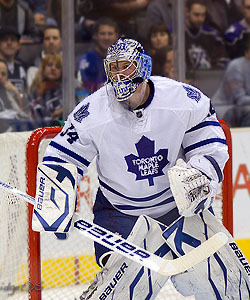 The Maple Leafs won the game 5–1, with Reimer recording 32 saves while picking up his first career NHL win. On February 3, 2011, Reimer recorded 27 saves and picked up his first career NHL shutout against the Carolina Hurricanes. A combination of injuries and poor play by Gustavsson and Jean-Sebastien Giguere provided an opportunity for Reimer at the NHL level. His strong play caused the Leafs to carry three goalies on their NHL roster, a fact which did not surprise Giguere, who said "The way he played the last time he was up, you knew he was going to get another chance." Leafs head coach Ron Wilson acknowledged Reimer as the team's starting goalie as they set out on a late-season run for a playoff spot, saying "It’s going to be his ball the rest of the way. As long as we stay in the race. And I think he’s up to it." Reimer became a quick fan favourite during his rookie NHL season, earning the nicknames "Optimus Reim" and "The Statue". The former is a reference to the Transformers protagonist Optimus Prime, while the latter resulted from head coach Wilson's attempts to suppress the hype around the rookie goalie only a short time into his NHL career, saying "There's all this [attention] around here, a guy wins a game and we're ready to build a statue for him." Reimer's strong performance was recognized by the league when he was named the NHL's Rookie of the Month for March 2011. Reimer would have become a restricted free agent on July 1, 2011, but he signed a three-year contract worth $5.4 million ($1.8 million salary cap hit) on June 9, 2011.